Every year tens of thousands of retailers prefer selling online over a traditional brick-and-mortar distribution model. Carolina Fonseca, our today's guest and a proud owner of Nutrivita Suplementos e-store, went digital far back in 2010 too. 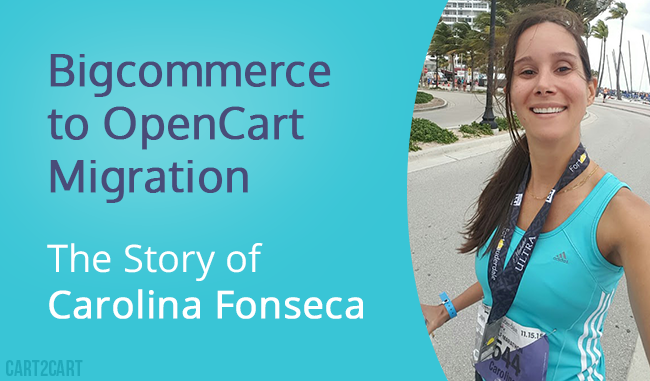 Few years later, she decided to undergo Bigcommerce to OpenCart migration using Cart2Cart, and has kindly agreed to tell her story and share the experience of automated data transfer. Q: Hi Carolina, it’s nice to have you here. So tell us, please, how did you get into e-Commerce selling sports nutrition supplements? Well, I first started off my business in 2007 with a physical vitamin store, located in Fort Lauderdale. I have passion for sports nutrition, running, and health foods. Then, in 2010 my business partner moved out town and I decided to open an online business by myself. It was hard at the beginning because I didn’t have anybody to help me and I didn’t have any experience in this field. Because I’m from Brasil, and I know that in my country there is a lack of good quality vitamins and supplements, I decided to open my online store in portuguese and ship all the products to Brazil. Q: You’ve really caught the wave with your business, Carol! The world got hooked on healthy lifestyle. Do you see a growing demand for the products you sell? And is there any place for others to enter the market of sports supplements? Yes, there is market for everyone! lol… I work with over 50+ different brands, and every day there are new brands showing up… but only the good ones will survive. We don’t want to carry millions of products that does not offer any quality or does not have good reviews with our customers. Q: Having your store represented on Facebook, Twitter, Google+ and Instagram, which of those social media platforms would you consider to have the biggest impact on your sales? We have success with Instagram. Its great and easy how you can target our customers just using the hashtag. Q: As we can see, you’ve recently performed Bigcommerce to OpenCart migration. What has caused you to do so? Couldn’t Bigcommerce sustain the needs of your business? Bigcommerce was great at the beginning, and for someone that does not have experience with shopping cart it is a great tool! But my business started to grow and I needed a platform that has multi-language system and also accept national credit cards from Brazil. Bigcommerce offers very limited payment gateway if you want to accept local payments from South America countries. Q: How was the migration using Cart2Cart itself? Were there any difficulties you encountered with? Also, what was the determinant of choosing Cart2Cart service? No difficulties at all! Everything is very fast and easy for someone like me who doesn’t understand too much about computers… lol… I was even thinking to hire a developer to do the work but it was no necessary at all. The Cart2Cart support answered all my questions. Q: Now, when Bigcommerce to OpenCart migration is successfully finished -- our congratulations! -- what’s changed? What are the benefits of running the business on OpenCart solution? I have been on OpenCart for 3 weeks and to be honest at the beginning I had some problems with the SEO of some products (I have migrated over 800 products!). Google analytics sent me an email 1 week after I finished the migration to let me know that there were few 404 pages… But its was quickly fixed. I understand that at the beginning the number of visits can be lower a little bit, but overall I am really satisfy with the results. Cart2Cart team is grateful to Carolina for her time she dedicated to answer our questions and give a constructive feedback on Cart2Cart service. We wish her luck, many customers and prosperity with her new store using OpenCart!